What I'm unclear about here and what i've found is that there are additional prerequisites to get the ami tools to actually run on Windows. Can you confirm what those might be? I've got a few VMware images that i've worked hard to customize and would like to get those bundled into AMI's and into EC2. Can you suggest a process for this or at least note any additional prereqs for getting the amitools to work withing Windows? Ivan, these instructions have worked well for me several times on Windows 7 and Windows 2003. I refer to them anytime I need to install the Amazon tools. While I haven't done it for a while I know they work. Hope this helps. Interesting that the AMI ZIP only contains Unix scripts, and not windows - as Ivan said. I wonder why Amazon missed these out? It seems that the ami tool are NOT working on windows without all the prerequisites or at least Ruby. When i try all the ami command on windows , nothing happenes and when i look in the file , it seems to try to start a ruby program. So I think that you at least need to hve Ruby installed on windows. I had the same issue. 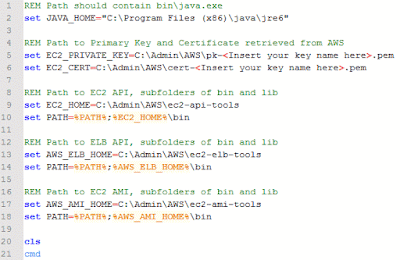 If the AMI tools work on Windows I haven't gotten it to work with the above (nice instructions though for API Tools). REM language governing permissions and limitations under the License. REM we're always dealing with defined variables in those tests. 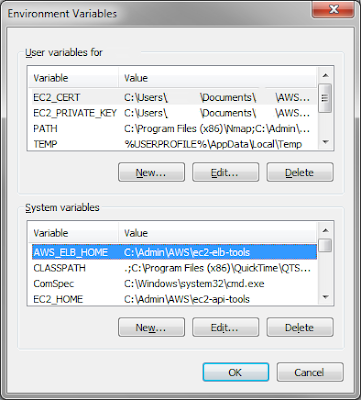 Save in the /bin directory as ec2-unbundle.bat. Hi, I performed the above steps on Windows 7 64 bit machine but its not working. I get the below error. Something might be conflicting on the environment variables.